Vice President for Research Sarah Nusser is passionate about the impact that Iowa State’s groundbreaking research has on Iowa and the world and the outstanding scholars who make Iowa State famous for its collaborative spirit, innovative ideas, and groundbreaking technologies. Nusser leads the research mission in partnership with Iowa State’s seven colleges, whose faculty and staff demonstrate exceptional creativity and insight to tackle a range of critical research challenges that represent Iowa State’s strengths: Enabling healthy lives, building sustainable human and natural ecosystems, creating next generation materials and manufacturing technologies, harnessing data-driven science and information systems for societal challenges, and developing global citizens and our emerging workforce. Under Nusser’s leadership Iowa State’s sponsored research funding has reached a new record high, supporting projects in both longstanding strengths and emerging areas of inquiry. Nusser has implemented Iowa State’s Grants Hub, which helps researchers tackle the next challenge in their sponsored funding pursuits — from their first grant proposals to large-scale interinstitutional initiatives. She also partners with Iowa State’s Office of Economic Development and Industrial Relations and the Iowa State Foundation to create new opportunities for investments in Iowa State research as well as commercialization of innovative technologies and ideas that emanate from Iowa State research. Nusser’s team focuses on building the careers of researchers on campus by helping faculty and staff build and sustain new research thrusts and interdisciplinary teams, connecting them with prospective sponsors, providing ongoing professional development, and offering financial support for new initiatives. Generous investments from the Office of the President and external donors and sponsors support programs to help researchers explore transformative high-risk, high-reward ideas from early stage to large initiatives. These include the Presidential Interdisciplinary Initiative awards, the Presidential Interdisciplinary Research Seed grants, and core support for facilities and instrumentation. Nusser also oversees leading-edge interdisciplinary research centers that represent key research strengths at Iowa State, as well as campus units that support sponsored funding, responsible conduct of research, and animal research services. 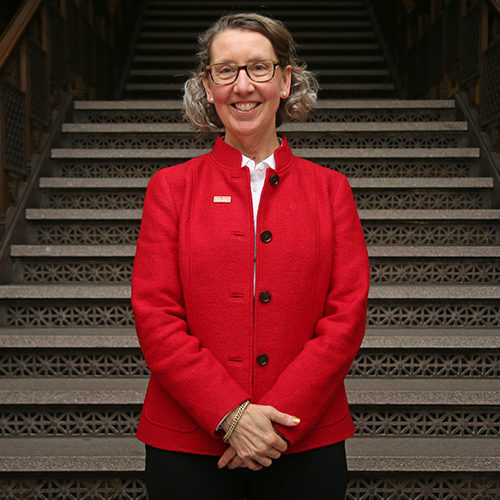 Nusser is professor of statistics and spent much of her career as director of Iowa State’s Center for Survey Statistics and Methodology. As director, Nusser led research in natural resource and human survey methods sponsored by the U.S. Department of Agriculture, National Science Foundation, National Institutes of Health, Census Bureau, and other agencies in the Federal Statistical System. Nusser has served on numerous scientific panels, advisory committees, and governing boards at the National Academies, National Science Foundation, Census Bureau, U.N. Food and Agriculture Organization, and statistical societies. She is a fellow of the American Statistical Association and an elected member of the International Statistical Institute and has received awards for excellence and service from Iowa State and the American Statistical Association. Nusser received a bachelor’s of science in botany from the University of Wisconsin-Madison, a master’s of science in botany from North Carolina State University, and a doctorate in statistics from Iowa State University. What excites you about the future of research? The way we conduct research is changing to embrace new possibilities for global collaboration through online and interconnected sharing of articles, data, and software tools. This brave new world of public access of research products not only updates the centuries-old paradigm of open inquiry through traditional forms of print media and scientific meetings, but also supports initiatives to increase transparency and reproducibility of research. The move to open scholarship will accelerate both the research process and translating of research impacts to the public.